This past weekend was a great one! The weather had been calling for snow all week, so we were anticipating a weekend indoors due to the snow (really limits visibility) but, ended up pleasantly surprised by the warm sun and blue skies! In preparation for the upcoming season, I took some time on Saturday to make some banana bread. On all of our Snake River rafting trips, we serve a special breakfast that calls for homemade banana bread. During the winter, I stock up on “red-band bananas” as our local market labels them and bake banana bread to stow away in the freezer for our upcoming Snake River rafting trips. It’s a great way to spend a snowy Saturday afternoon, while Parker is in EMT class. 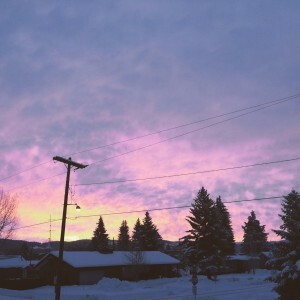 Sunrise over our sleepy little town. Sunday, the snow cleared away and the skies were a magnificent blue! 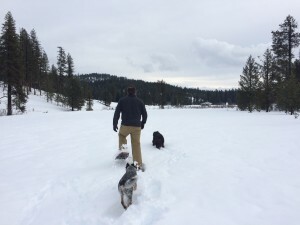 A day spent outside was calling us, so we loaded up the dogs and the snow shoes. 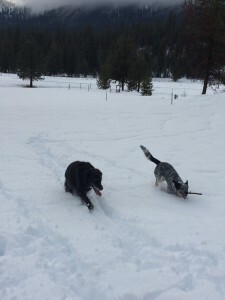 Many of you may remember Tub and his antics from the Snake River rafting trip: #HellHikeandRaft, he was visiting over the weekend, so he joined our adventure and played in the snow too! It doesn’t take long to get from our shop to pristine untouched snow, like a whole five minute drive and we were in a great big meadow with snow shoes strapped on and ready to go. After the first 1/2 mile or so, layers were shed, it was a beautiful day. We explored a bit and with tired pups and tired humans, headed back to the car. Fetch is exhausting in 4 feet of snow! How was your weekend: what were your adventures? Any snow-shoeing or baking? The food! Food is by far one of my favorite hobbies: menu planning, shopping, cooking, prepping, etc. etc. I love it all! 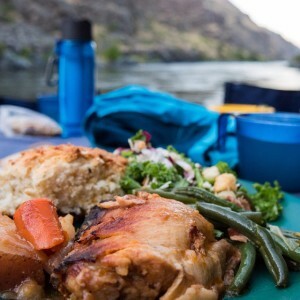 So, it’s no surprise that food is my favorite part of a rafting trip. The food that we bring is delicious, don’t get me wrong, but there’s something absolutely magical about having a leafy green salad, a crisp glass of wine or a huckleberry hotcake fresh off the griddle. Eating in the backcountry is an adventure all in itself! Unplugging! No cell phones, no computers, no electronics. Each time I go on an Idaho white water rafting trip I reel through my to-do list, thinking of all the things I didn’t do, emails I didn’t send, etc. But, as we descend further into the river canyon, there is absolutely nothing I can do about it, my iPhone will be in airplane mode for the next four days, and that to-do list will be there when I get home, as they say, out of sight out of mind. I re-focus my thoughts to what I’m about to experience and take it all in. The Tranquility! There is nothing more peaceful than the quiet of the river canyon, hearing oars dip in and out of the water in rhythm. The tranquility offered by the canyon is top notch! It’s hard to find that kind of quiet anywhere, the noise that you do hear is laughter, rushing water, conversation, camaraderie, and pure happiness. River Time! Being on river time is hard to recover from. There are no watches, no deadlines and no time constraints on the river. We eat when we’re hungry, wake up when you’re refreshed, drink when you’re thirsty, nap on the river bank if you’re tired, it’s the ultimate vacation, let the sun dictate your schedule, reconnect with that primal self that we try to suppress and shape into the person that dresses up for work, arrives on time and always answers the emails. 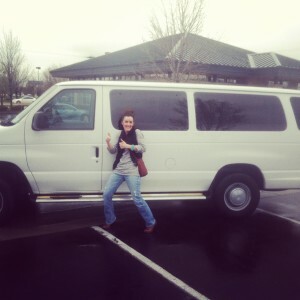 An Idaho white water rafting trip will give you the time to shut the door on that person, even if it’s only for 3 days. Quality time together, on the river. Floating along the Salmon River. 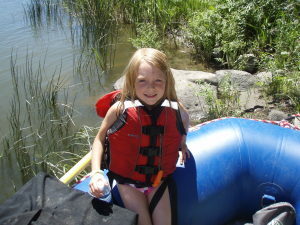 Idaho white water rafting. These folks are on River Time! These are just a few of my favorite things about an Idaho white water rafting trip, of course I really do love every bit of it, but this is what sets the trip apart for me. What truly makes me miss the river when I’m not there. The itch has set in and I am already counting down the days until I get to see the deep river canyons again. The river has a way of getting under your skin and settling in, it’s something that will pull you in and make you want to stay or come back and visit again. What are your favorite things about a river trip? Welcome back from a cold January weekend! 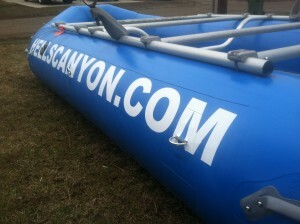 Here at America’s Rafting Company headquarters, we’ve been gearing up for our summer already. Hard to imagine wearing shorts, sandals and sunscreen when the high is a bone chilling 20 degrees outside and snowing, but summer will be here before we know it and we’ll be ready to put on some white water rafting trips! In order to be ready, we start planning a year or more in advance. We spend the winter keeping up on our social media accounts, emails with past and future clients, gear upkeep and most recently facility upkeep! Phew, winter is almost as busy as summer for us! White water rafting trips take a lot of planning and prep work behind the scenes, so we really do need an entire off season to get caught up and ready to go! 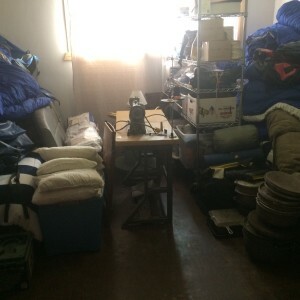 Prepping for white water rafting trips by packing everything into two small rooms! with oodles of ice, milk and fresh produce, I head back to the warehouse and unload everything, of course I always have donuts for the guides to sweeten the deal! When the car is unloaded, the warehouse becomes a war zone- zucchini and pineapple rolling around, once we even had a giant watermelon drop and crack on the ground which ended up being a sweet sticky mess! 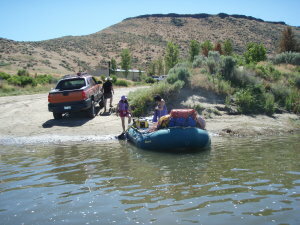 Eventually those groceries are packed away in coolers and boxes, ready to go on white water rafting trips the next day. There are 4-6 people milling around the warehouse with checklists flying and reminders piped out to whoever is listening. It was always great fun and very rarely was anything forgotten for the white water rafting trip, it all worked out in the end and if we finished packing early enough, we were awarded an afternoon at Lost Lake Reservoir! and lots more counter space and you guessed more storage! So, Parker and I have started work on what will be a new and improved warehouse, in the meantime, above is what an entire rafting company looks like shoved into two very small spaces. 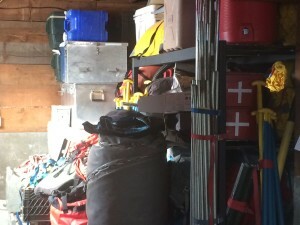 Good thing we played a lot of Tetris growing up, we’ve needed that expertise to stack boats and boxes and coolers and life jackets and sleeping bags and dutch ovens and who knows what else! Keep your eyes posted for updates on construction, organization and white water rafting trip planning! 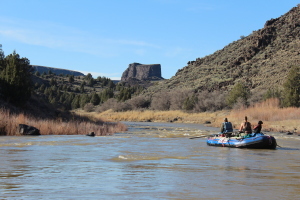 In the last post about the Owyhee River, I talked a lot about the history of the Owyhee River and why America’s Rafting Company loves this little river, “Oregon’s Grand Canyon” so much. 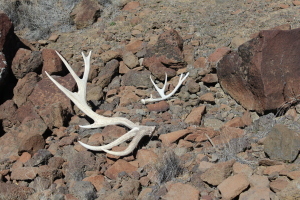 The history behind setting aside acres and acres of land for a designated wilderness is fascinating and something that anyone with a passion for the outdoors, preservation, wildlife, ranching, and living should read about (so click here to see it). Our great nation has made a point to set aside land and let it be wild- no roads- no motors- no wheels- accessible only under your own power, or that of a horse. This is unique to the United States, there are few other countries in the world that have done this. Reading up on the wilderness act, you will likely find information about Idaho, the state with the second largest wilderness area, Alaska is the first. You’ll also read about senator Frank Church from here in Idaho, for which the Frank Church River of No Return Wilderness is named. Being stewards of the land as an outfitter is an honor and a privilege that we don’t take lightly. That is one of the reasons why we love what we do. 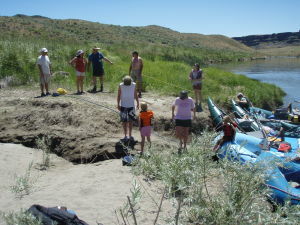 Joining America’s Rafting Company on a multi-day river trip will give you a sense of that, especially on the Owyhee River where you will feel like the only people on earth, where the land is wild and the foot print of man-kind is so small, sometimes you’ll wonder if you’ve been the only person to stand in that very spot along the Owyhee River’s edge. 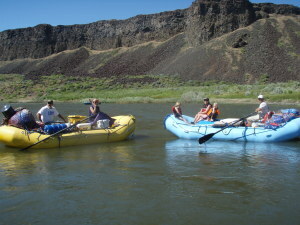 The Owyhee River white water rafting trip that we offer is so much more than just rafting. There are hot springs along the river’s edge. The fishing is outstanding! Before the dams were placed on the Snake River, the Owyhee River was an outstanding fishing ground for Chinook Salmon traveling back from the ocean to spawn. Now since the dams are in place, the Salmon do not run wild and free like they used to. Being on an Owyhee River trip, you’ll see pictographs and hopefully other artifacts, we tread lightly on the ground in order to preserve the river for those still to come. It’s an opportunity that not many people get, but if you do, it’s one that you won’t soon forget. Hello 2015! We made it, glad to be here. This post is more of a Holiday review than just a weekend review, we took some time off to be with friends and family over the holidays. We hope you had a great Holiday Season, too! The crew at America’s Rafting Company sure did, we are very fortunate to be surrounded by a great group of friends, awesome and supportive family and amazing clients that all help make the holidays merry and bright. Now that 2015 is here, we are starting to think about white water rafting in Idaho again! Looking forward to an even busier season this year. We kicked off our Holiday Season with a get together of friends, most all of them are/have been river guides. It was so great to see everyone and catch up. Working in the outfitting and guiding industry often means that during our busy season we don’t get to see our friends and family as much as we’d like and sometimes not at all. Having friends that are river guides means that A) they “get” our lack of communication, and B) they’re on the river too, so we’re really not ignoring each other, just waiting for slower days to come around. 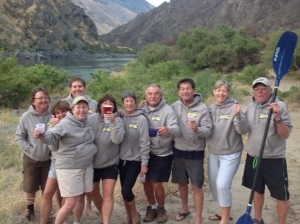 So, in spite of hardly getting to see each other during the season, we plan for celebrations and get togethers in the off season, where river lore and stories about white water rafting in Idaho are told. Mingling and walking around the party, there was a ton of talk about the river canyons, how we’re glad to have a break, but can’t wait to go back! White water rafting in Idaho is just around the corner, so for now we’ll soak up our off time with some reminiscing and holiday cheer! We also got to see lots of family and spent the time cooking, laughing and eating oh, and of course there were some gifts exchanged too! Christmas is such a magical time in Idaho, especially for America’s Rafting Company. Being from Northern Nevada, we did get snow here and there, but nothing like the amount of snow we have piled up in our yard now, and for me- the more the better! We truly live in a great place, with four distinct seasons, winter wonderland being my second favorite to summer of course! I digress. Back to the holidays: New Year’s came and went without a huge bang, instead the evening was spent around the fire with movies and treats and family. Closing the door on 2014 meant welcoming 2015 with open arms, which leaves us looking back at the year, remembering what a great one it was and feeling nothing but excitement and enthusiasm for what 2015 will bring to us. Here’s to a New Year and a whole lot of white water rafting in Idaho! New AIRE boats tatted up with our website. 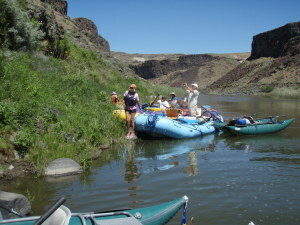 The Owyhee River, has been deemed the “Grand Canyon of Oregon”. This place holds a special place in the hearts of America’s Rafting Company. As born and raised desert dwellers, we spent our youth’s in the great outdoors of Northern Nevada. Both Parker and I were raised in Winnemucca, NV and were often shooed outside by our mother’s, we grew up with wide open spaces and freedom to explore. Perhaps that’s what draws us in to the river canyons of Idaho and Oregon. These places are still free and wild and HUGE! You can travel for miles and miles along the river and not see another soul. That is my kind of adventure. The Owyhee River and it’s canyon lands are no exception to that, in fact, the Owyhee River may be one of the most remote rivers floated to this day. 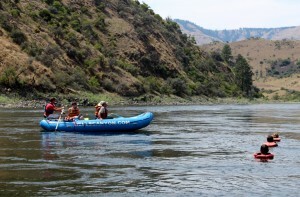 It’s by far the most remote river that America’s Rafting Company floats. The access and boat ramp are in the middle of nowhere and you’d better have 4WD if you want to get out of the river canyon in one peice. The take-out is a dirt road that winds for miles and miles and in the Spring time can be pretty muddy. But, what’s a river trip without some mud on your tires and long twisty roads to get into it? like that of the Snake River through Hells Canyon. The Owyhee River Wilderness is the second largest wilderness area in the country that is not located within a National Park, National Forest or National Wildlife Refuge. The act of putting this land into Wilderness took a ton of cooperation on many agency parts, including the BLM. Many members of the ranching and farming community came together to work with government officials to ensure that the land was taken care of and all parties would benefit from making this land wilderness. A Wilderness means more than just heading out into the back country and spending some time in nature. In a Wilderness area, there is no traffic other than that on foot or hoof. Nature is allowed to truly be. There are no roads, no change (other than what Mother Nature intends) there is no place on Earth quite like a Wilderness, getting the chance to see this marvelous landscape is something that not many people get to do, that is why America’s Rafting Company holds this river as a special place in our hearts, it is truly an adventure to float through the wild canyon with it’s rhyolite cliffs, sand castle formations and towering canyon walls, access is limited and peace and serenity come easy. It’s a once in a lifetime kind of trip that we’ve been lucky enough to take many times in our life and hope to take you someday too. Now that it’s Tuesday, the past weekend is slowly slipping away and seems like something of the distant past. But, in reality America’s Rafting Company had a stellar weekend, one that will be in our mind for many years to come! We attended the Annual Idaho Outfitters and Guides Association (IOGA) meeting. IOGA is a great association that America’s Rafting Company is proud to be a part of! 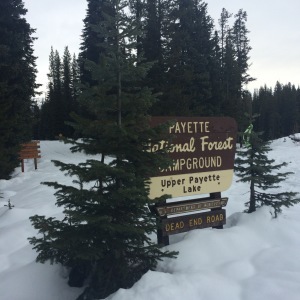 The life of an Idaho whitewater outfitter is not all rafting and hiking, we participate in legislative and administrative groups to ensure that we are able to continue our business, taking guests into the backcountry in this great state of Idaho. It’s always been an important aspect of the outdoor industry to collaborate with all of the agencies involved in the governing of our river canyons and mountain tops. After all, we operate our business on public lands and are privileged to be stewards of the land. We remember that every day while we’re in the backcountry. We tread lightly, take only photographs, and pack everything out. 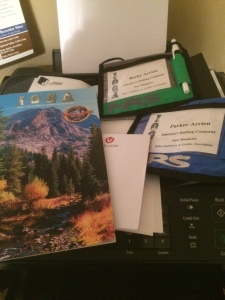 The annual IOGA meeting is held every December in Boise, ID. People from all walks of the outdoor world come together and attend the meeting. There are outfitters and guides, as well as agency professionals from the USFS, BLM, and IOGLB, there are also outdoor industry vendors such as AIRE and Cambridge Welding. It’s a great crowd of people! I am in awe of the IOGA for bringing such a dynamic, vivacious and busy group of people together to commemorate and reflect on the season past and look forward to the upcoming year. America’s Rafting Company was lucky enough to be represented by both Parker and myself. We attended meetings and viewed documentaries. We got the chance to meet other outfitters and guides from the hunting and fishing side of outfitting. We were able to catch up with fellow river guides and outfitters that we usually get to see in passing during the rafting season, often picking up and dropping off our whitewater rafting trips. America’s Rafting Company took every opportunity to sit and chat with industry leaders and listen to new ideas about where the outdoor industry in Idaho is headed. The IOGA works hard to represent all of us outfitters, both on a supportive and legislative level. In fact, they host a lobby day each February in which the IOGA puts on a luncheon and government officials are there to sit and have discussions about the issues that effect outfitters and guides throughout the state. It’s important to have those face to face meetings. The IOGA knows that and provides those opportunites that would otherwise be swept under the rug. They ask the hard questions and provide the space to get the answers. It allows for some of the most out of the box thinking and we are thankful to have spent the latter part of our week with such like-minded and professional people. We look forward to furthering our relationships with outfitters from all over the state as well as agency officials and legislative representatives. Preserving what we have and ensuring that generations to come will be able to enjoy Idaho’s back country is on the forefront of our minds and we rest easy knowing that there are so many other passionate souls out there to help make it happen! The mountains are calling and I must go. This is a mantra that plays through our heads often. We love the mountains, whether it’s a snow capped peak here in Meadows Valley, or a high ridge mountain towering above Hells Canyon, Snake River, we hear them calling all the time. They loom in the back of our minds with the promise of adventure. This past weekend was no different. America’s Rafting Company heard the mountain’s call and we headed out. This time, since we are well into December now, the mountains are covered in snow! So much snow that a snowmobile was our means of transportation. Our mountains don’t have nearly enough snow, but there was plenty to play! 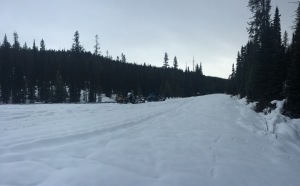 America’s Rafting Company loaded up the snowmobiles and headed out with friend and fellow river guide, Tony Herold. The weather was comfortable, albeit a little foggy. But, there was no rain or wind to speak of and we were thankful for that. Rain and snow can do a number on your face when traveling at speeds of 50-75 mph on the trail. We had a mission to complete yesterday, the annual harvesting of the Christmas tree. 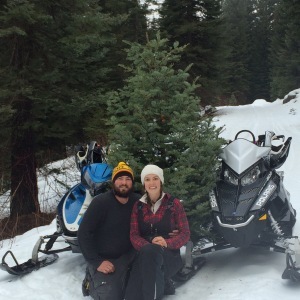 But, before that there was some exploring to do and we didn’t want to have a fir tree strapped to the back of the snowmobile all day long, so we kept our eyes open for the perfect tree form and headed out on the trail. 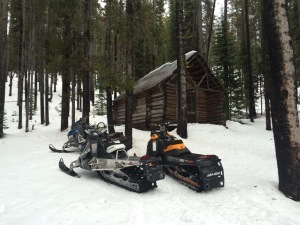 We rode just outside of McCall, Idaho. It only took about 25 minutes to get from the warehouse to the parking lot, we live and work and play in the heart of everything outside and mountain-y. Little snow covered cabin, tucked in for winter. Dead end road, with no winter access, unless you’re on a snow mobile! We turned around to slowly start making our way back to the trucks, but still keeping our eyes out for trees. Just a couple miles before the parking lot, I had spotted a looker and kept him in the back of my mind. I hadn’t seen anything else that topped the tree, so I led the crew over to the tree and we sized it up, a little bigger than we wanted, but we have a pretty big window to fill at the house, so the tree would work just perfectly. America’s Rafting Company had chosen the tree for 2014 and they were happy with the selection. Once home, the smell of fresh cut pine enveloped the house. The mountains had called and America’s Rafting Company went. It was a great weekend spent with friends in Idaho’s back country. 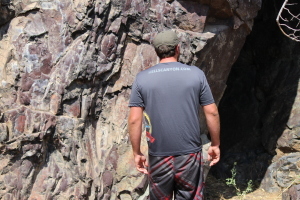 In the deepest canyon of North America- Hells Canyon Idaho, there are tales of history as deep as the canyon. The history along the banks of the Snake River is rich and very alive today. Whether it’s an old homestead, a hay field, an irrigation tunnel or pictographs left from Native American Tribes, there are remnants of days gone by. Around every bend in the river, there’s another facet of history to explore. Hells Canyon Idaho is fascinating for any history buff and the best way to see it all, is in a raft with America’s Rafting Company. Some of the most intriguing history, is that of the Native American Tribes that once inhabited the river canyons and traveled on the high ridges. Their mark can still be seen today. 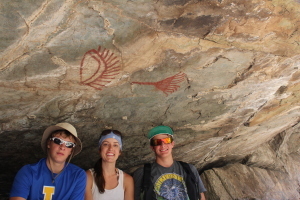 Viewing some of the pictographs in the canyon leaves you pondering the meaning of the image, the meaning of life and the reason for our existence. Hells Canyon Idaho is a breathtaking and awe-inspiring back drop to do some real contemplation and self reflection. Rock Shelter that shows deep black smoke marks above. There are canyon walls along the Snake River that still show signs of a long ago camp fire, where Native American’s spent many nights in the shelter of the canyon’s walls. They would have used long sticks and branches laid against a rock face at an angle to create a shelter, while spending their days along the river banks foraging and fishing. Another home that we commonly see in Hells Canyon Idaho is called a “pit house”, it is merely a depression in the earth now, but when in use would have been much deeper and likely had a roof of branches and sticks. This type of dwelling is built where there are no rock faces to access. There are spots along the river canyon that are much more conspicuous and take some real thought and expertise to understand the importance to the Native American people. For instance, a confluence with a creek and the river where there is a bench on top would have been a cross roads to mingle and prepare for the upcoming journey, whether they were headed into the canyon to fish the fall Salmon run or up on top of the palouse to dig and store Camas root. There is a place similar to this, right along the Salmon River that is currently studied every summer. The University of Oregon has come back each year for the past 11 or so years and uncovers a mighty pit that they have dug. So far they have found artifacts that date back 11,000 years ago. 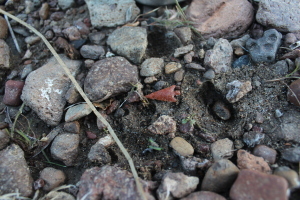 They commonly find shards of basalt which are chips of rock from building arrow heads. There aren’t many arrowheads to be found, they are usually found in hunting grounds. This leads researchers to believe that the area was used as a camp site to build and repair supplies before heading into or out of the river canyon. The different tribes of Native American’s that frequented Hells Canyon Idaho were Shoshone-Bannock, Northern Paiute, and Cayuse Indians. But, the earliest tribes in the canyon were the Nez Pearce Indians. The canyon was ideal for so many reasons for inhabitaion, but perhaps the most relevant includes the mild winters and early/abundant plant and animal life. Hells Canyon Idaho is so deep that it stays comfortable even in the Winter. Spring arrives earlier in the canyon than up in the high country and the Fall temperatures stay nice and comfortable much later in the year. 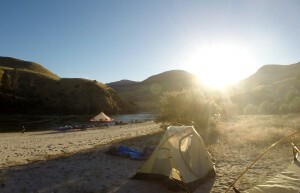 In fact, I have been rafting in Hells Canyon Idaho in January, it was cool, but not cold! There were green grasses growing and the buds of wild flowers were starting to show. We saw wildlife of every array, as the high country gets snowed in, the wildlife are pushed down to the river to find food, shelter and water. I can only imagine what the canyon would have looked like when the Nez Pearce Indians were there and called the walls of the deepest canyon in North America home. Sunset to end our Thanksgiving Celebration! Phew, what a weekend we had! We hope that your Thanksgiving Holiday weekend was full of fun and maybe a little adventure! Here at the ARC headquarters, things were pretty quiet, we were actually out of town, enjoying one of our many adventure trips ! This trip happened to be focused on family, giving thanks and lots of turkey! As were many other adventure trips around the country over the holiday weekend. We headed South to Nevada to celebrate with friends and family. We heard from many of our past guests and wished a Happy Thanksgiving back and forth, it was great to hear from those near and far! Dutch oven cooking on one of our adventure trips! Not all of our adventure trips include extensive travel and turkey, most include very regional travel and dutch oven cookin’! 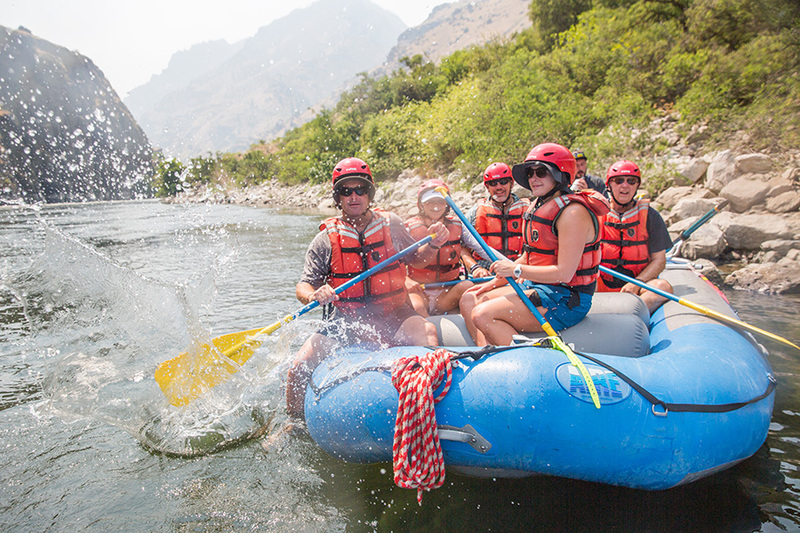 Out of all of our adventure trips, our most popular is our Snake River through Hells Canyon whitewater rafting trip. 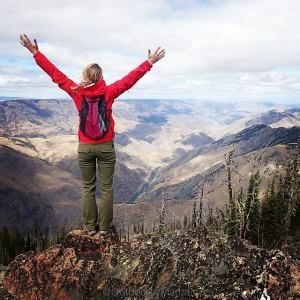 Being the deepest canyon in North America, many people have Hells Canyon on their bucket list. 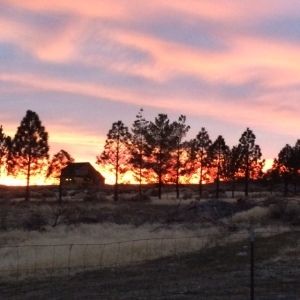 Once you arrive in the McCall, ID area, we travel a short distance to the put-in at Hells Canyon Dam and have everything packed and ready to go! Including the dutch ovens, which we use to prepare meals like our famous “roasted river chicken” or baked brie and grape appetizers! 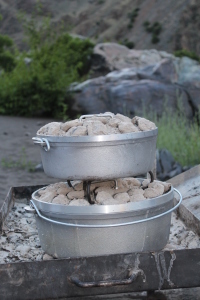 The dutch ovens work hard and so do we to put on our most popular adventure trips!